Criticality means overall target value. 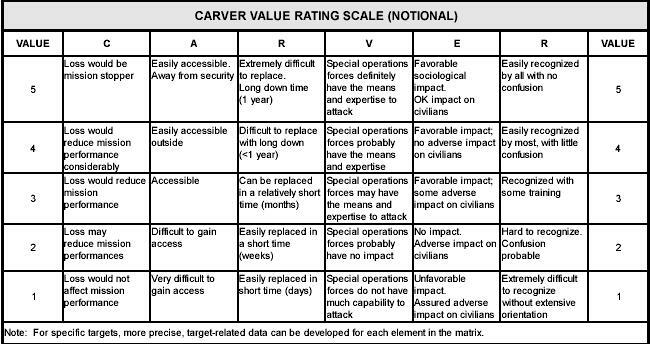 Overall target value is determined based on a targets importance to a system, sub-system, complex and the overall ability, if the potential target is left intact, for it to perform its intended function. 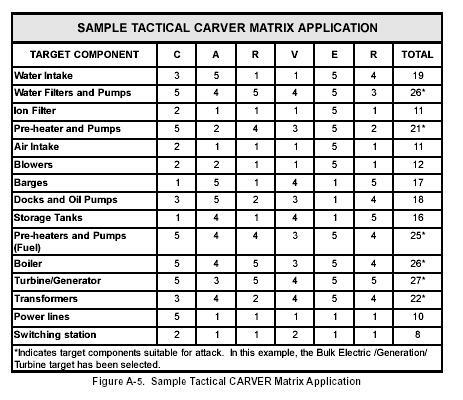 This is the primary consideration in targeting because the potential target, having this value (Criticality) strongly reflected in a strategic or tactical decision, will greatly enhance the chances of mission accomplishment. A target is critical when its destruction or damage (or protection/development depending on the framing and perspective of the matrix) has a significant impact on military, political, or economic operations. In total, a target is given an advanced level of Criticality when it’s destruction interrupts or eliminates the targets ability to perform it’s necessary functions hence enhancing the likelihood of mission success. 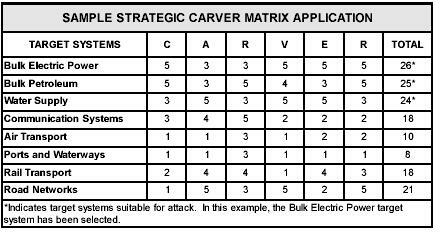 Targets within a system must be considered in relation to other elements of that target system. An example might be if strategically, Bulk Electric Power is to be targeted, then the generation of this power (power plants) would be a target-able element within that system and further the subsystem, for example “Turbine/Generator”, would also need to be considered. All of the components in relation to the system as a whole must be taken into consideration. The value of a target will change as the situation develops, requiring the use of time-sensitive methods which respond to the evolution of situations. For example, when one has few locomotives, railroad bridges may be less critical as targets; however, safeguarding bridges may be critical to maneuvering conventional forces, which require the use of such bridges. Another example would be something involving an organization, business or government agency whose entire communicative network is contingent upon the properly functioning system of a third party host, for example: AT&T. When the third party host is compromised successfully via online assault or “Hacking”, which AT&T has been more than once, the more critical government agency is affected, as communication is now impossible or at the least compromised. If an organization or institution whose communication is still largely analog (not arguing FOR the use of analog equipment just detailing an example. Obviously Digital communication equipment and imagery is superior) then this is not so critical a component due to what actual “hackers” are capable of achieving against analog systems. However, in more advance economies utilizing digital communications, an assault on those particular systems and a loss of communication, particularly in conjunction with a secondary physical assault on critical infrastructure could be devastating. Time: How rapidly will the impact of the target attack affect operations? Quality: What percentage of output, production, or service will be curtailed by target damage? Surrogates: What will be the effect on the output, production, and service? Relativity: What is the number of targets and their position in the system or complex flow diagram? Table A-1. 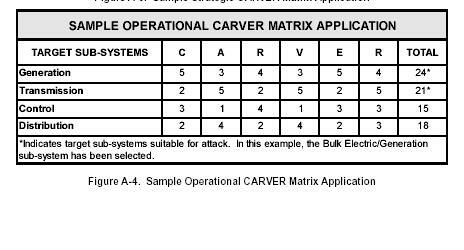 Shows how criticality values are assigned within a CARVER matrix. Table A-1. Assigning criticality values. Targets and attacks that provide the most immediate and strategic high value criticality to the aggressors are often terribly lamented tragedies by the world at large immediately and years later. The depth of emotional pain, physical destruction and political turmoil that these “Omega” level events deliver is staggering, hence from a strategic and tactical point of view, these are very successful. During the final stages of World War 2 in 1945, the United States conducted two atomic bombings against the cities of Hiroshima and Nagasaki in Japan, the first occurred on August 6, 1945 (Hiroshima) and the second on August 9, 1945 (Nagasaki). A. The range of the aircraft, which would carry the bomb. B. The desirability of visual bombing in order to insure the most effective use of the bomb. C. Probable weather conditions in the target areas. D. Importance of having one primary and two secondary targets for each mission, so that if weather conditions prohibited bombing the target there would be at least two alternates. E. Selection of targets to produce the greatest military effect on the Japanese people and thereby most effectively shorten the war. F. The impact on morale with the enemy. A. Since the atomic bomb was expected to produce its greatest amount of damage by primary initial blast effect, and next greatest by fires, the targets should contain a large percentage of closely-built frame buildings and other construction susceptible to damage by blast and fire. B. The maximum blast effect of the bomb was calculated to extend over an area of approximately 1 mile in radius; therefore the selected targets should contain a densely built-up area of at least this size. C. The selected targets should have a high military strategic value. D. The first target should be relatively untouched by previous bombing, in order that the effect of a single atomic bomb could be determined by both the designers of the weapon system as well as the indigenous people from that area and other foreign governments. The weather records showed that for five years there had never been two successive good visual bombing days over Tokyo, so based on the lack of good weather, careful and selective planning was necessary. The attacks were obviously successful and that success was apparent within hours. This is a critical component of a “High-OMEGA” level target, the rapid shockwave that affects the target area and the enemy. In addition to the destruction of infrastructure, physical injury and damage the psychological impact that these attacks had on the people from the target areas and on the country as a whole were massive. The sheer terror that these “OMEGA” targets instilled in the people from the target cities caused them first to immediately flee the attacked areas abandoning anything that could not move on its own. The cities became completely deserted. It was also weeks before any sort of clean up or reconstruction could be attempted. Another pronounced affect was that for people in a country that had weathered aggressive fire bombing at the hands of the allied coalition, a group of people that had become almost apathetic to hundreds of planes racing overhead, suddenly the site of a single, solitary and slow moving plane struck the absolute fear of death into them. The lingering affects on the Japanese, and particularly on the people from the shattered cities were immense. Although the Atomic Bombings of Hiroshima and Nagasaki did not win the war for the U.S., they clearly finished it.